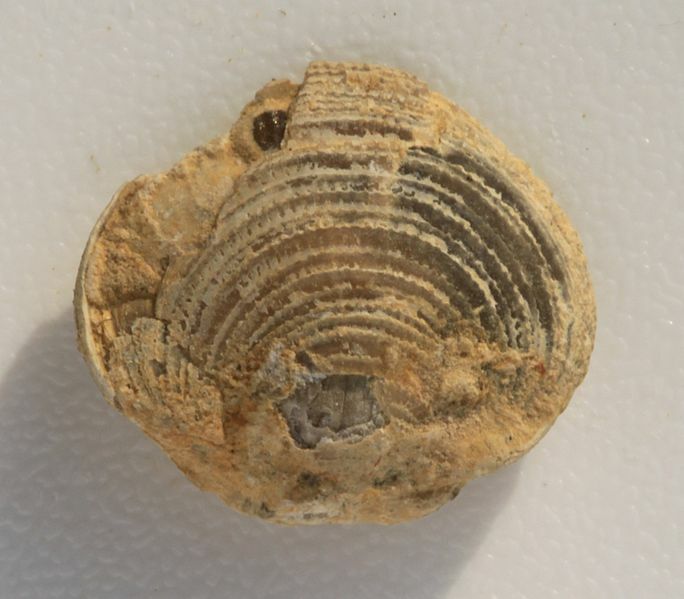 A specimen of the Devonian Athyris fultonensis photographed by Kentuckiana Mike. 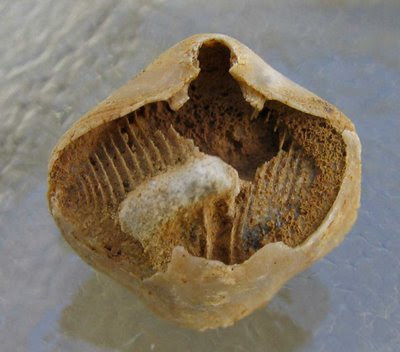 This specimen has part of the shell broken away to expose the calcified spiralium underneath. The Athyrididae were a family of brachiopods that lived from the Silurian to the Permian, or until the end of the Triassic if the Diplospirellidae and Retzioidea are derived from the athyridids (Alvarez et al. 1998). Many athyridids possessed concentric lamellae on the outside of the shell; in the Upper Devonian to Permian Cleiothyridina, these lamellae were developed into a dense forest of flat spines. Specimens of the Devonian species Athyris vittata with preserved colour patterns indicate that the presence of radial stripes (Blodgett et al. 1988). The Athyrididae are members of the order Athyridida, one of a number of brachiopod groups to possess a calcified spiral support (called, funnily enough, a spiralium) for the lophophore (see the link above for an explanation of the brachiopod lophophore). In the 1965 Treatise on Invertebrate Paleontology volume for brachiopods (Moore 1965), all the spiralia-possessing brachiopods were combined as the Spiriferida; however, other features of the shell are not consistent with a single origin for the spiralium, and they are now divided between the Spiriferida, Atrypida and Athyridida. The Lower Carboniferous lamellate athyridid Cleiothyridina sublamellosa, photographed by Dwergenpaartje. The fine spines projecting from the lamellae in this genus have been mostly worn off in this specimen. Many spiralium-bearing species appear to have lived on soft sediments, and it is possible that the spiralium was developed primarily as an adaptation for such habitats (Alvarez & Brunton 1990). For filter-feeders living in such habitats, the greatest challenge for feeding is not so much taking in food particles, but keeping the filter (in this case, the lophophore) from becoming clogged by indigestible particles such as sand. Reversing the direction of beat of the lophophore cilia moves such particles back towards the shell opening, where rapidly closing the valves will give the final impetus to 'spit out' the offending particles. In those species with lamellae, the slow-down of water currents as they hit the lamellae before the water enters between the valves may have also reduced the amount of particulate matter getting in. The lamellae may have also helped to support the shell opening above the sediment surface, though more significant in this regard would have been the pedicle, the fleshy stalk emerging from an opening in the back of the shell that anchored the athyridid in the sediment. Alvarez, F., & C. H. C. Brunton. 1990. The shell-structure, growth and functional morphology of some Lower Devonian athyrids from northwest Spain. Lethaia 23: 117-131. Alvarez, F., Rong J.-Y. & A. J. Boucot. 1998. The classification of athyridid brachiopods. Journal of Paleontology 72 (5): 827-855. Blodgett, R. B., A. J. Boucot & W. F. Koch II. 1988. 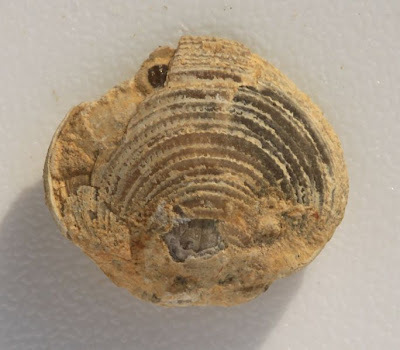 New occurrences of color patterns in Devonian articulate brachiopods. Journal of Paleontology 62 (1): 46-51. Moore, R. C. (ed.) 1965. Treatise on Invertebrate Paleontology pt H. Brachiopoda, vol. 2. The Geological Society of America, Inc., and the University of Kansas Press.